Minne's earliest drawings date from his academic period between 1879 and 1886. For the most part, they are studies of the human body, probably assignments, sometimes after a live model, other after sculpture pieces from the classical antiquity, the Renaissance or the Baroque, His drawing style is yet somewhat clumsy, with hesitant contours and shaded surfaces. His numerous anatomical animal studies are from a later date, probably made around 1891 during a visit by the artist to Paris. 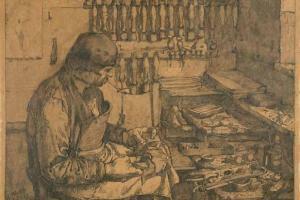 The washed ink drawing The Shoemaker dates from 1887, and it is the only known stand-alone drawing by Minne from this period. The subject, however, is unusual amongst Minne's remaining drawings, but fits in with the typical 19th-century importance on crafted interior tableaux. Minne's sketchbooks and separate study sheets allow us to follow the thought and work method of the sculptor. His sculptures already take on form on the paper; moulded studies by his hand, however, are preserved only by exception. A single sculpture is also based upon a dozen or so sketches, which are sometimes very hastily drawn. The sketchbooks, coming from circa 1886-1888, show the various angles that the young sculptor was occupied with within his merely twenty years of age. A direct indication towards his sculpture work from the time is found central on one of the pages with the contours of Mother Grieving over her Dead Child. In the sketchbook with figure studies, dating from around 1894-1896, we can see how Minne sought out various positions in order to ultimately bring them to realisation in sculptures such as John the Baptist and the Small Figure Kneeling. The book contains dominating studies of naked male figures and figure groups, in which for the first time Minne's preference for the extreme extension of figures comes to the fore. In the sometimes very free sketches we are witness to the genetic process of his sculptures, through which in particular Minne's attention to the three-dimensional form and an expressive movement is revealed in a direct, sometimes aggressive drawing style. Some of the sketch pages are only a first draft for already or not-yet executed projects. In other pages the artist focuses on an essential element of the image, such as the backwards, light turning movement in The Prodigal Son, which in each of the rapid drawings he further develops. For the Fountain with Kneeling Youths, there are a great number of studies known that at times the kneeling figures have as the subject and in others that of the supporting water basin. The preparatory sketches allow for us to see some surprising changes in Minne's concept. Thus, some studies show a group of four youths stepping around the basin, holding hands. Another sketch shows then again his attempts at the desired profile of the water basin. Minne continued to think about the concept of the fountain for his entire life. Ultimately he produced five models in plaster. Drawings from sculptures are usually linked to their sculptural work. Thereby is the drawing seen as a phase in the artistic thought process. The preceding study work remains for the most part hidden from the outer world. The public at large only gets to see the produced sculpture itself. From the 19th Century on, however, sculptors begin to view the drawing steadily more as a discreet, self-standing medium. The duality in the artistic process, between sketched studies and stand-alone drawings, we find not only with Minne. Contemporary sculptures such as Auguste Rodin, Aristide Maillol and Constantin Meunier place equally expressed attention on the self-standing drawing. 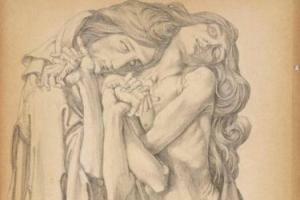 One part of Minne's independent drawings comes about between 1886 and 1900, his most creative years as a sculptor. Between 1914 and 1919, Minne remains as an exile in Wales; in these years he designs not a single sculpture, but he is, however, indeed especially active as a draftsman. The series of some 400 articulated charcoal drawings from the time have a place in the separate rubric on Wales. In the stand-alone drawings from before 1900, Minne goes through a clear evolution of style. 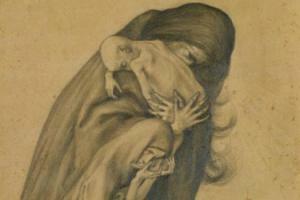 In the ink drawings Mother Crying for her two Children (private collection) and Mother and Child Lying in her Arms, the emphasis is on the purely linear. Delicate and sparsely used shadings give the figures and the rockery in Mother Crying for her Two Children a certain volume and spatiality. In Mother and Child, Lying in her Arms, Minne brings depth into the work by the place of the vertical and horizontal shadings in contrast with the waves of the water. 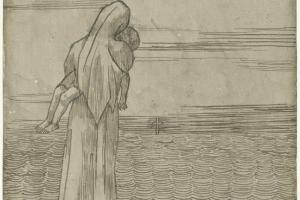 Completely different is the pencil drawing Mourning Mother from 1890 in which a more pictorial angle softens the contours. The drawing was purchased along with two others by Grégoire Le Roy. Mourning Mother and ... now belong to the MSK collection. In The Outcasts, Minne combines various aspects of his drawing style: the extension of the figures and the excessive formation by accentuating the joints and angular jutting body parts give the work an outspoken expressive character. The complex play of lines of the entangled figures, the waving linearly drawn hair and the majestic folds are associated with the art-nouveau style of Jan Toorop, among others.